Whether you’re a fan of today’s music or have an ear for something more classic, this year’s 50th anniversary Woodstock event has something for everyone. Jay-Z, Miley Cyrus and Imagine Dragons are among the contemporary offerings for this year’s three-day event, while David Crosby, John Fogerty and Dead and Company are the oldies. 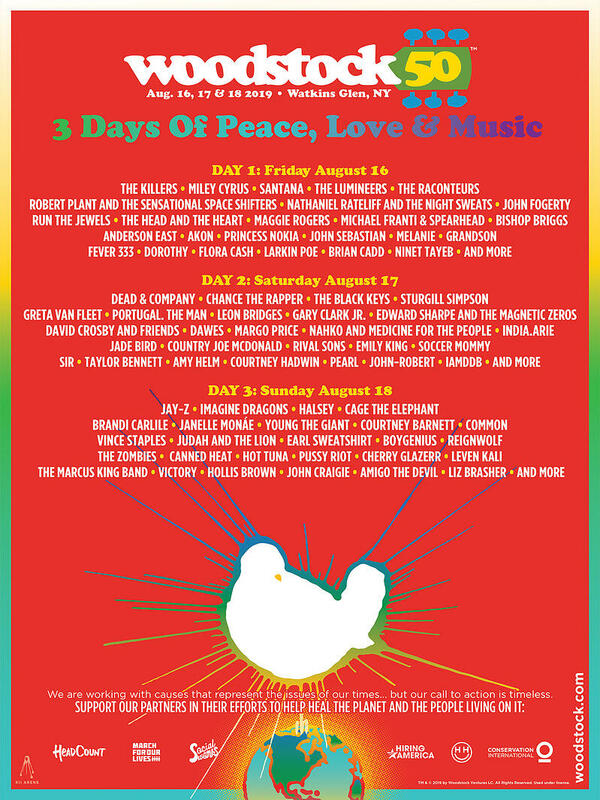 Woodstock 50 - 3 Days of Peace, Love and Music, as it’s being billed — will be August 16-18 in Watkins Glen, New York. The event commemorates the 1969 Woodstock Music and Arts Fair, which was considered a key turning point in music history. Secondary market Woodstock 50 tickets are available at TicketIQ.com. While primary market tickets to the 50th anniversary event will go on sale April 22 at woodstock.com,. Fans interested in attending can sign up for ticket and festival updates here. Some of the headlining acts include Santana, Miley Cyrus and John Fogerty who will be among the performers on Day 1; Grateful Dead spinoff Dead and Company and David Crosby and Friends are scheduled for Day 2; and Jay-Z, Halsey and Imagine Dragons are scheduled for Day 3. The Grateful Dead and David Crosby, who was then part of Crosby, Stills and Nash, performed at the original Woodstock in 1969. The band Santana, which had not debuted its first album yet also played at the first Woodstock and will return for this year’s version. Other key performers set for the 50th anniversary are Chance the Rapper, The Black Keys, The Lumineers, Robert Plant, Janelle Monáe, The Raconteurs, Sturgill Simpson, Cage the Elephant, Brandi Carlile, Greta Van Fleet, Run the Jewels, Edward Sharpe and the Magnetic Zeros, Dawes, and Princess Nokia. The original Woodstock drew about 500,000 people and 32 acts performed over three days in Bethel, New York. Among the more iconic performers were The Who, Joan Baez, Janis Joplin and Jimi Hendrix. This year’s event isn’t the first revival. In 1999, Woodstock co-founder Michael Lang put together a 40th anniversary event, as well. The site of the original Woodstock has been converted into Bethel Woods Center for the Arts, which opened in 2006 with a performance by the New York Philharmonic. Original Woodstock performers Crosby, Nash, Stills & Young also performed there in 2006.